Tiny, fast, quiet, and with 28X zoom (28X optical, 12X digital). This is Sony's best 'video conferencing' camera, a replacement for the venerable EVI-D70, with great features like 28X optical zoom, 340-deg pan, switchable for hanging or upright mounting - but also quieter pan/tilt operation, improved low-light performance, and wide dynamic range capability. 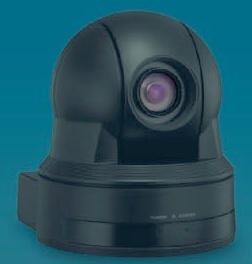 $1629.95 complete with CamMotionPro software suite for local and network-remote operation. Thank you for visiting the Videobotics CamMotionPro90 Page.